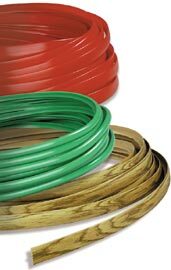 A unique custom-formulated, non-toxic polyethylene is used in the manufacture of Patwin's "Flexelene" Moldings. The outstanding flexibility resulting from this formulation permits the fitting of any contour, whether outside or inside curves and radii. This material is very smooth to the touch and can be color matched to meet exacting requirements. Its look, durability, and resistance to impact and corrosion make it the most economical way to finish the edges of panels, tabletops, shelving, and more. Through the use of state-of-the-art extrusion equipment (computer driven and monitored with laser technology), Patwin's quality control guarantees a product that is consistently precise in dimension, workability and color. The unique design of these moldings assures an installation that will seat firmly and hug the edge permanently. They will cut cleanly to form a nearly invisible seam and are shipped in coils to minimize waste.